We are proud to announce that we are selling high quality Organic INDIGO POWDER, Henna powder, Amla powder to color your hair in the most safe and effective manner at home. We are also selling Organic Coconut oil that is used for cooking and personal use. Hair coloring using our Organic Indigo powder is a natural alternative for hair coloring minus the chemicals. It is 100% Organic and 100% Natural. I have seen people purchasing what is known as Black henna in the market but I was warned by my mother not to use it because there is no such plant that gives black henna leaves, I enquired in many nurseries and found out that there is no such thing. But many trusted shop owners informed me that in black henna, a dye is added to give the black shade. I was shocked because that doesn't make henna organic or pure anymore. It becomes a chemical based dye. The customers are being fooled. 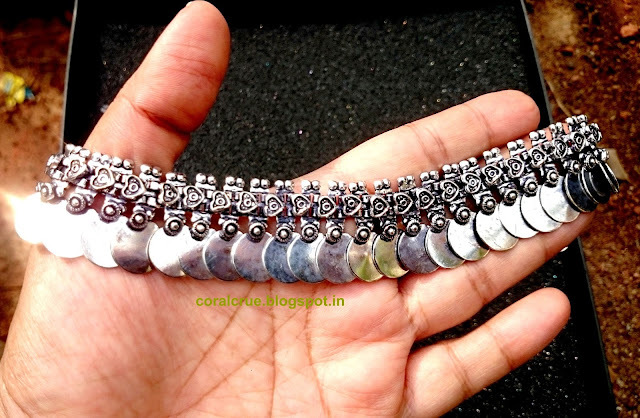 That's when I decided to start Coral Crue where we offer you the ability to purchase natural Indigo powder, Henna and Amla from this very website. If you would like to place your orders for the same, please mail me at coralcrue@gmail.com or use the Blogger Contact form you can see on the top Right hand corner of this blog, right below the picture of the Indigo powder packet. We dispatch to all over India, Pakistan, USA, Dubai, Australia and the rest of the world that have a postal pin code. Let's talk a little bit more about Indigo leaf powder as some of us are still unaware of the benefits of this lovely natural hair dye. It is also called Neela Amari Herbal Hair Dye and is made from the sun dried leaves of Indigofera Tinctoria. After the process of sun drying, the leaves are crushed and milled to a fine powder and we pack it for delivery. Most of us use henna which gives a deep orange color to our hair. Using Indigo powder gives you a youthful and rich, more natural deeper shade in comparison to the stark orange shade. Depending on how your hair condition and colour is, after the use of indigo, your hair gets a deep black or brown shade depending on the proportion of henna and indigo powder used, and also based on what your normal hair colour is before you start. I have untreated hair which is a deep brown colour, it stained my hair pure black and I am happy with the results. My parents and grandparents have been using this powder for years and it was known to our family for generations together. It's no secret for us and we do not ever use chemical hair dyes. We all have great hair :) People always ask us our secret. Detailed instructions are mailed to you, below is just an introduction about the usage of the product. Never refrigerate or freeze Indigo powder. It contains no harmful chemicals or toxic metals. Once the packet is opened please re-seal it tightly for further use as it should not be exposed to air. Always use plastic gloves for your hands when using it as it will stain your hands black, make sure that you are not wearing your beautiful dresses when you apply this as it will stain the dye the dress or area where it falls. Take necessary precautions. If it's your first time using indigo, first apply henna to your hair for over 6 hours. Please do not add anything to this henna like salt, herbs, eggs etc. You may add a little lime juice to the henna mix to make it give a deeper shade. Rinse the henna after few hours of application with water. Make sure that if you have any grey or white hair, all the white hair should become red from henna for indigo to do it's job. Then mix the indigo leaf powder with some water to make a very thick paste like a thick mud pack. Apply it immediately and let it sit on your hair for minimum 1 - 1.5 hours. Make sure that you coat all the red hair(which was earlier white) adequately. Wash off with water. Indigo will take two days to oxidize and show the real colour. So please do not use any chemical shampoos till then else it will strip the hair of it's newly obtained black shade. Rinse only with water. As indigo stains clothes and tiles, please cover all work surfaces and use an old dress when you are applying the same so that you don't make a mess. That my dear friends is the secret to getting beautifully and naturally dyed hair that you can flaunt daily, at parties or special occasions. Delivery: Free to any part of India through VPP. You will have to send us your complete postal address with pin code and a working phone number. If you require product urgently, we can send it through courier in which case payment will be to my account by only NEFT BANK TRANSFER. Kindly note we don't take cash deposits. We also send the same products overseas to Pakistan, Middle East, USA, UK, Malayasia, Australia, New Zealand, Germany, Russia and if you would like you may contact us for rates and shipping charges. We also sell Organic Henna and Organic Amla powder. If purchased along with Indigo powder, the cost of Amla and Henna are reduced to Rs.180 for 100gm each. Try our products and be amazed at what natural hair colours can do for your hair, health and confidence. I got to know about Baobab powder only when I decided to do a review on Pandavita's product. I guess we get to learn a lot while blogging and this is one of the best products I have come across in the learning process. 2017 is the year of health for me and what better way than to start the new year with a blog post on something so refreshing and healthy. If you are a Paleo person, then this product is right up your sleeve. It is also great for those who are following a dairy free and gluten free diet. It is suitable for vegetarians and vegans. Here's what I found out: Baobab is the common name for Adansonia genus of trees. They grow in Madagascar, Africa, Arabia and Australia. Baobab grows on a tree and is actually a fruit!! It is the only fruit in the world that dries up on the branch. The fruit is found inside hard pods that hang upside down from the tree and have a citrusy flavor. The dried fruit is powdered, it is nutrient-dense and there is no other stage to processing which makes most of these powders, organic naturally. In Africa, this fruit has been used for years to combat fevers, scurvy, malaria, gastrointestinal issues etc. Baobab is a natural preservative as it contains high amounts of vitamin C, potassium and phosphorus. If you want to increase your energy levels naturally, manage your blood sugar levels, detoxify your body and rejuvenate your skin then you must try this fruit powder. Due to all these health-enhancing features, baobab is a super food. It is a naturally source of vitamin C and antioxidants, it is also high in fibre and claims to be nutrient dense. It happens to have more antioxidants than blue berries and Goji berries!!!! You can sprinkle on to a fruit platter, include it in your yoghurt, stir into soups, hot water , bake with it and blend into smoothies. It has a pleasantly sweet and mild citrus flavor. I prepare this by taking one scoop and mixing a little water into to make a paste, then add the rest of the water and stir it till dissolves. I have not found it easy to dissolve in any other way. You have to make the paste first. Once you make a paste, you can use it in any way you want. My preferred way being to add it to plain water and stir it to make that delicious citrus drink. It does not need to be sweetened which is my other favorite bit about this powder. It is naturally sweet and has the perfect tanginess, not too sweet or sour. Just right. It makes for a very delicious drink and the health benefits enumerated just make it all the more desirable. 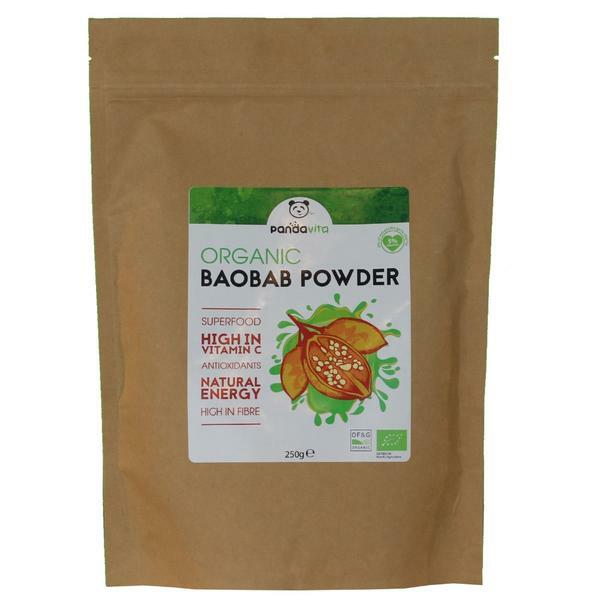 Have you tired Baobab powder? Would love to know your thoughts on the same. Open-eyed meditations is a beautiful compilation of thoughts wherein each meditation takes you on a journey to the past, bringing a secret herb to heal a problem in the present. Beyond the storyline, something deeper is waiting to be discovered from these ancient texts. This book is an attempt to cover the hidden layer of wealth that is cleverly packaged within the common storylines. Shubha Vilas is a noted author, spiritual seeker, motivational speaker, lifestyle coach and, above all, a story teller par excellence. He holds an engineering degree and a law degree with a specialization in patent law. 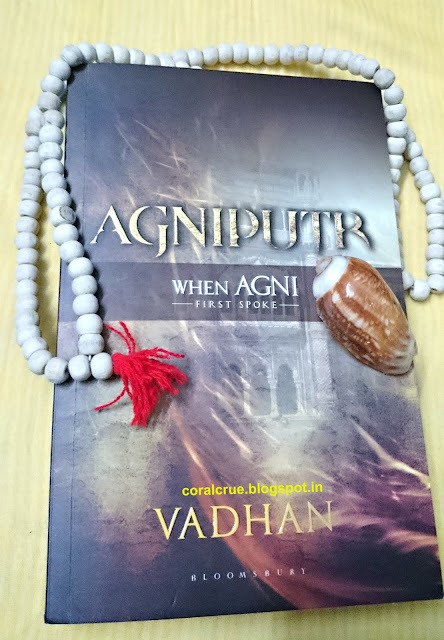 Needless to say that I am quite a fan of his spiritual writing and the essence in his story telling is brought out with such simplicity that you can instantly link it with your own personal experiences. This book took me the longest time to read, just because it made me think and correct so many thought patterns. I had to take a good, hard look at myself and introspect every day that I read this book. It was definitely one of the best learning experiences because it was just me and the book, and my thoughts and memories. The author has compiled a collection of various aspects of life, inspired by watching the world through the lenses of the vedic epics - The Mahabharata and the Ramayana. He deals with modern day problems that haunt today's generation, providing deep insights into the situation through a narrative from the ancient epics. At times, one feels one is stuck in an avalanche that seems to rapidly pull you down. In such circumstances, one looks for a helping hand to pull us up from spiraling down. This book teaches one to observe keenly and meditatively, to pause and reflect. For instance, the first chapter is based on the art of listening. Being in the profession of diagnosing, I have a formed habit of taking a person in, while they talk to me. We are taught in medical school on how to scan a person from head to toe, the minute they step into the consulting room. It took me by surprise, after reading, that this formed diagnosis without completely hearing the patient out, is quite damaging. And practising listening without coming to a conclusion leads to healthier interaction and fruitful communication. In today's day, we find that we do not get the kind of physical, emotional and mental space that we really need. I cherish how the author has written about the yoga of non intervention and how to maintain a healthy distance from those you really want to connect with. It really is about how we allow and appreciate people for who they are and what is the requirement for creating exact replicas of everything? Each teaching experience in the book focuses on the essence of every topic and, finally, this essence is summarized in a box at the end of each chapter, pretty much like the foot-notes that were so special in his earlier publications. 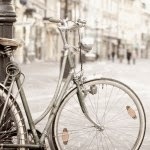 Dealing with over analyzing certain things in life, he suggests that we disconnect from lower thought processes and all lower connections when trying to reach for higher goals in life. He gives us techniques to focus and move ahead in life by switching off everything below it. Decision making skills has been impressively dealt with in a chapter that brings forth several circumstances from the Mahabharata. With such lucid examples, you get to see what drives emotional decisions. Anxiety can truly make one decision-less. in many aspects of life. We keep searching, go through anxious days filled with pain, grieving over and procrastinating rather than taking determined action. So, what does the author suggest about motivation? Interestingly he says, 'Discover your likes and motivation will discover you.' Doesn't that sound like an exciting journey to venture on? As you keep turning pages and I really turned the pages real slow because I had to absorb all this tremendous wisdom, chew up on the pearls that were all over the pages and you can't believe how simple the logic is and yet we lose track and sight of the self. Several topics like being in service to your surroundings, dealing with emotions like anger and jealousy, how to overcome fear, perfectionism, trained intelligence to deal with a hurt heart, how to deal with negativity and feeling hurt by ones you love the most are dealt with in such a simple way that you need to read and re-read to let it all sink in. I have to say this book kept picking me up from the morose of all of this month- October, you have been a hard teacher. People make our lives hard but what makes it harder is the way one's mind deals with situations and negative people. When you are under siege, you feel that you are drowning and I felt a mental check with each and every line I read from here and has given me more intense and deeper internal dialogues with my self. Let me go ahead and quote some of my favorite parts of this beautiful book and you can go ahead and read the rest in the book itself. "Appreciate and accept people the way they are while simultaneously allowing us to remain at peace in the way we are." "Analysis leads to clarity but overanalysis leads to garbled thinking." "Analysis boosts action, overanalysis causes paralysis." "Discover your likes and stay motivated for life." "A mind that is focused on many things is focused on nothing." "Negative experiences cannot hurt a person unless he allows them to seep into his mind." "True love is respect inspite of shortcomings." "Fear is the outcome of resisting change that challenges what you guard the most. To the degree one is willing to let go, to that degree fear loses it's power. " There are also several chapters on leadership and management. There is a lot of complexity put into the writing and brought out in a very simple format that even to the untrained mind, this looks like a gift of solutions put in such simple chapters. I clearly applaud the author for his sheer emotional brilliance and bringing it all out with his effective story telling. For me, this is by far my absolute favorite work by Shubha Vilas. The chapters are short and precise. The book piques the interest of the reader with current topics for both the youth and elderly. This is practical knowledge which doesn't require any tools to understand. All it requires is a shift in your basic mind set and your time. It will take practice and in depth ruminating to alter and adjust your set mind patterns. Kudos to the author and looking forward to many such learning experiences. In the 1940's, close to Eluru which is the headquarters of West Godavari in Andhra Pradesh, in Gudem village an almost irrevocable energy is created by a maleficent Aghora tantrik. He achieves this by invoking an uprising at the Samadhi of Rajah Raghuram Surya, who was murdered by his brother with the help of the treacherous tantrik. Rajah Raghuram Surya belonged to the royal zamindar family and was the eldest son. Royal blood mixed with gore and the story stirs up vile details to be regarded in the initial setting admixed with the dark art that leads to something of an apocalypse. The tantrik does not know of his fate but as ill fated as his experiment was, he too, gets gobbled up by the invoked powerhouse known in present day events as the Sutram. It looms privately below the memorial hall where the main events of the story are to take place, growing quietly but viciously turning the memorial hall into it's own hunting ground. Rajah Raghuram's son, Surya, was only 7 years of age when his father passed away. Surya was afflicted by muscular dystrophy since birth. He, too, disappears mysteriously in the 1970's. Right after his disappearance, all the evil in the village of Gudem ceased, for the time being till present day when it starts again.The day he disappeared he was accompanied by two other people, of which only Rathaya came out alive, burnt to a grill. Satyanarayana Raghava Kasavari aka SRK, a young scientist, commissioned by the CSIR and working for the paranormal activity division finds himself not too far from the village of Gudem for his betrothal to the love of his life. Hearing the story of Sutram from friends at the bar, he could not contain his excitement to discover what he might unearth if he happened to visit the forsaken place. Despite warnings from his father and village elders, he decides to visit once. He informs his boss- Sheila Pitambar- and sets off. Here the plot starts to thicken and the book takes on a vibe of it's own. Sheila sets out to Gudem after getting the backing of the Home minister to find out how to contain and what is generating thousands of tetra bytes of electrical power out of nowhere. Babu Garu is summoned to his village and the 100 year old haveli, after several years, by a government notice. Walking through the rooms of the castle brings back memories as he explores the places and things left behind by his ancestors. It also brings back what he was running away from all these years. He refused to meet Rathaya who had something only for Babu Garu's ears and has been waiting for him for a very long time. What is it? With a tightly knit plot, the author weaves very well a science fiction and fantasy thriller dexterously before the reader's eyes. His words weave a very picturesque plot which is fast paced and racy. One can feel their pulse racing at certain times throughout the story. 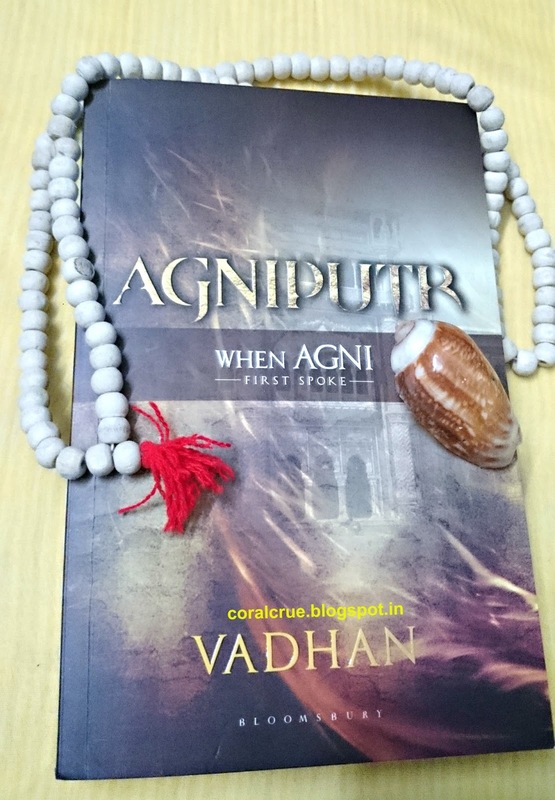 It's hard to put down this book once you get reading and you just want to know how Agniputr is wielded and if the Sutram can really be contained by a mere man who does not have an inkling of quantum physics. He has to travel the breadth of the country and try to unravel what his father was trying to tell him from beyond the grave. Does he make it in time or does the Sutram begin to release itself from it's containment after 60 years of entrapment? ps- I did find a very small mistake in one of the pages but that can be easily overlooked. 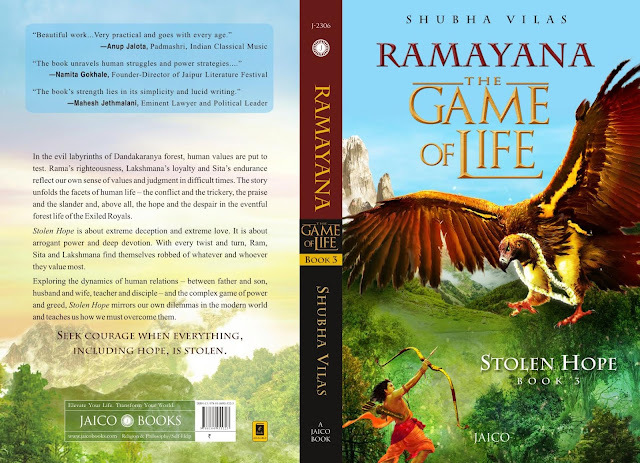 Shubha Vilas is a noted author and spiritual seeker who brings us the teachings from the Ramayana in the form of Stolen Hope, where he explores the dynamics of human relations. Stolen Hope is the third venture in the series of writing on the Ramayana. Have you ever had to make a life decision - one that would alter the course of your existence forever? This precious collection has given me time and footnotes to retrospect, pause and change perspective at a crucial juncture in my life. The book has been sitting with me since the beginning of this year.Time and travel took me to places where I thought I'd never be this year. I came back and found myself lost after the journey. The book naturally fell in to my lap and I have been sitting with it, thinking and reading while it's been pouring outside. Nine chapters beautifully elucidate the journey of Rama, Lakshmana and Sita leaving Chitrakuta on exile to traverse through the mighty forest, Dandakarnya. Starting with the story of Danda and his lust, the author depicts how power when embezzled to harm a weaker person can destroy everything that leads up to itself. Amidst the aura of austerity, the trio pace their journey to their newly allocated humble abode where destiny starts to unravel the expectation of Rama's arrival. An aura of purity and austerity welcomed the trio. The practices performed by the sages have been described in detail along with the spotlessly maintained exteriors that helped them develop a sparkling and uncluttered atmosphere. One is led to understand how maintaining these practices help in perfecting one's life. Meditation helps enhancing inner vision, thereby removing one's dependence on external vision which can be deceptive at times resulting in endless complications. The stories of several sages are retold- one which struck me is an example of Sage Mandarkini whose years of focused attention when comes in contact with a few moments of inattention, led to years of distraction, which inadvertently happens to the best of us. While Rama and Sita adapt to the ways of the forest, Lakshmana's devotion is exemplary, encompassing the three qualities possessed towards a divine master - bhavajna, kritajna and dharmajna. It is pivotal to note the brothers' have been portrayed as sensitive and emotional beings who are very receptive to the plight and pain of others, hence undertaking dangerous ventures in superseding the attempts of many demons who disturbed the peace of Panchavati; which invariably leads us to the account of Surpanakha. She is highlighted bringing to light the behaviour of those who are insensitive and selfish, an embodiment of most of what is happening in present day society; that is treading over innocent and docile people to achieve all their selfish wants. Surpanakha, basically catalyzes a blood-filled massacre which is accounted in great detail. Rama demolishes the demon outpost in Janasthana single-handedly, leaving Akampana to escape to recount the tale whimpering to Ravana. Surpanakha, again, is responsible for the events that lead to Sita's abduction. The separate entry on Sita had my undivided attention . There is a detailed description of the significance of the blade of grass. On further reading, there are also notes on dealing with hurt in relationships. Lakshmana's tale is such, how he wisely teaches to deal with such conflicts in a relationship. A deer pursued by a tiger cannot be in a state of mind to think about grazing peacefully. Peace is a priority when the mind is stable; amidst turbulence, however, the priority is to seek mental stability. Extermination of other's opinions is demoniac life. Coexistence of opinions is saintly life. Virtues and vices coexist in each individual. When vices try to exterminate virtues, then Rama needs to come in. When negative forces drive fear in us, instead of focusing on spiritual upliftment, we shift focus from inward evolution to outward resistance/aversion. When hope is a launch pad, even a blind man can soar to the moon. To handle a dust storm a camel has three eyelids. Similarly to protects one vision from the storms of confusion, one needs vision to see beyond the layers of ignorance. And blessed to be able to talk about this beautiful book. I am a little partial to my reading of The Game of Life , nevertheless Shubha Vilas took me on a magical journey and I am elated to have completed Stolen Hope which I am sure will be a great read for all the knowledge seekers out there. Being a regular online shopper, I find the price and convenience of shopping at Limeroad too tempting. Portals like LimeRoad gives one the benefit of finding beautifully crafted ethnic and western goods which you can't possibility find in your own vicinity, delivered to your doorstep. I have been eyeing and purchasing a few things on and off from this wonderful website and after my third experience with them, I felt the time was right to review. What sets this site apart and this is the really exciting bit- If you have an account with them, you also get to play stylist. You get to create particular styles and show them off in your scrapbook. This is by far the reason, I keep going back and looking at the site. There's always something very dynamic to create and shop for. The bonus is that for the looks you create, you get limeroad credits which can be used to shop with. Unlike, the regular e-commerce portals - Limeroad is set apart by it's feature rich website. Products are not just confined to garments, they have a huge selection of furnishings, decor, accessories, bags, kitchenware, you name it....they have it. Almost! I usually end up going very crazy over their Indian wear, the ethnic stuff is just brilliant with a variety of material to chose from. I have gone ga ga over their dupattas, stoles, bags, shoes and furnishing. I also really love some of their brands like Zero Kataa for jewellery. I keep getting asked where I get some of my beautiful silver pieces from and, well, I'm letting the cat out of it's bag. hehe!!! Let's take a look at what I ordered from them this time, shall we? Four days after ordering, I received this package. I love the summery green packaging. I resist ripping it open like a crazy person and resort to elegantly slitting the sealed portion. The product is bubble wrapped well within the confines of the parcel. A sturdy cardboard box holds my esteemed piece of finery. I am actually really pleased with the sophisticated black cardboard box packaging by this brand. It makes it look like a really expensive gift housing some hidden treasure. And the piece is hidden treasure indeed, wait till you see it. 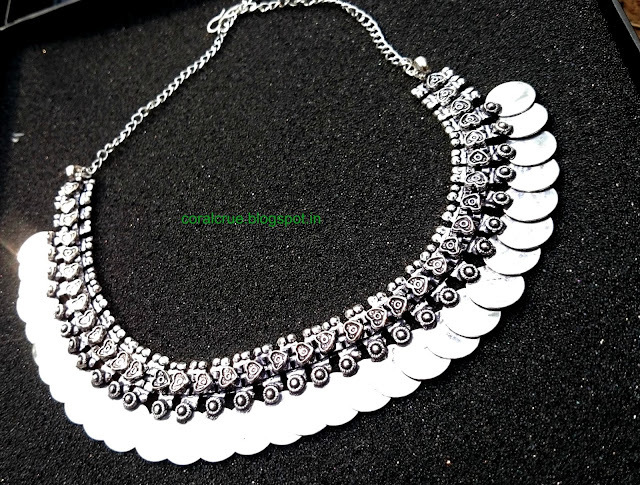 It's a beautifully crafted German Silver Necklace .I was looking for a short necklace and this was just love at first sight. I love how there is an eclectic mix of traditional versus modern all combined together into this piece. The necklace is sturdy but not too heavy. It's really made well. I like the small silver beads that lace the edges at the top, the centre holds a pattern of repetitive hearts which have silver coins laced at the ends. I bet you want me to share the link for this product so that you could immediately place an order, don't you? To sum it up, I really enjoyed receiving this product. The service was really fast, I had a couple of doubts to be addressed by the customer service people who were really very prompt, they answer questions quickly and get to the bottom of any issues adeptly. Their return policy is very good. I have had the best experience with customer service on this particular online portal. 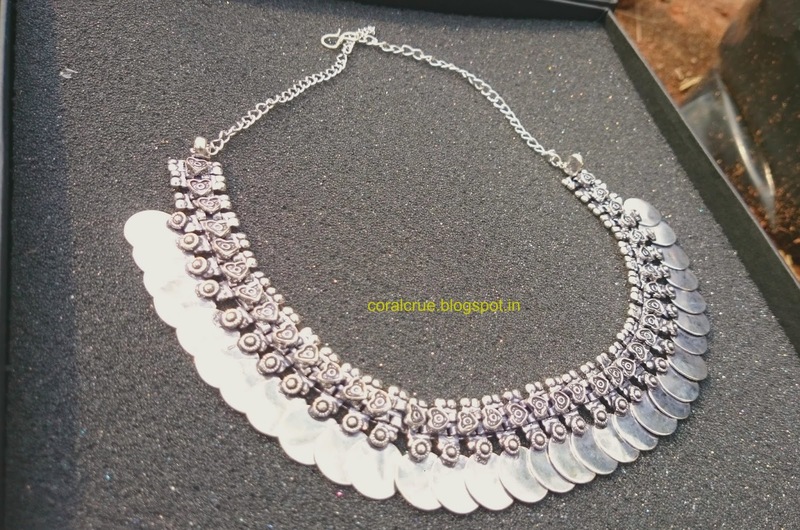 The prices are great, they hold sales frequently and also if you are a regular shopper, they add LimeRoad (LR credits) to your account, so you can get massive deals on your favorites. They hold these awesome social media contests, I haven't won any so far but I still love to participate and create looks/styles. There is a huge group of budding fashionistas and stylists on their team, competing with their looks is not so easy because some of them are celeb stylists too and the looks they create are out of this world! I have some more things to show you from my Limeroad hauls but I will save that for another post. You should really check out their jewellery and sometimes they go out of stock really soon. I had been eyeing a piece of earrings from the same brand for an entire year, it kept going out of stock. No prizes for guessing why, as you can see how lovely their work is. All in all, I highly recommend this site. What do you like shopping from this website, if you have shopped from them? Any favorite sellers? Would love any recommendations. 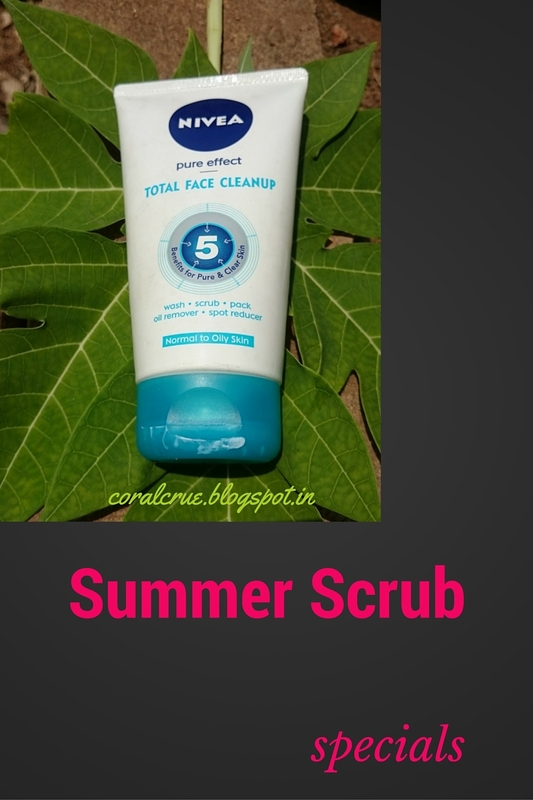 Another hot summer's night and I reach out for my almost empty bottle of face wash. Toners are in use in plenty but the face washes are the ones that are being used and thrown by the bottle. Since I use it twice a day in summer, I prefer something mild and gentle but at the same time it needs to work with any signs of grease on the face. It should feel good too. Which is why I keep going back to this brand. Gentle enough wash to use everyday for clean and clear skin. Recommended for those who want to remove excess oil from their skin and prevent pimples. Liquid formula cleanses deep without causing dryness and hence can be used daily. Product comes in a plastic bodied, orange-toned clear and light plastic bottle which is very convenient to carry. A purple flip-cap top mechanism helps to squeeze out the accurate amount of product that is required. No frills packaging. It is so light and easy to carry. The product comes out as an oozing transparent liquid and is very light. You need a little more than a dew drop size to cover your entire face. 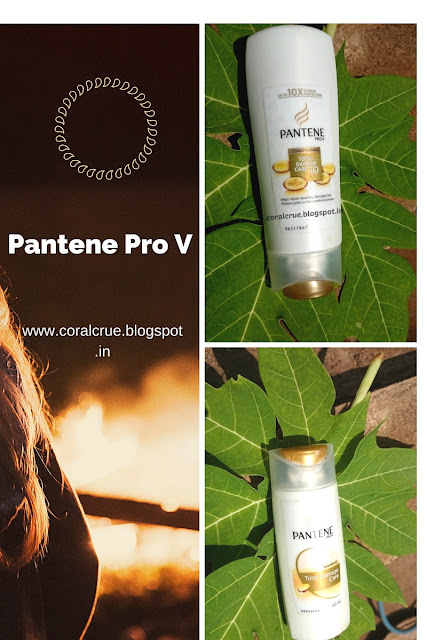 It foams and is very mild on the skin which makes it good for the sensitive skinned, and can also be used frequently as the formula is not drying. It controls oil secretion for perhaps about two hours tops in humid climes. After which you need to rinse out your face again. I have not faced any issues of breakouts with this product and hence I give it a green signal. Also, I see myself purchasing those cute little bottles of these in the other variants. It has a citrusy-floral scent which is very mild and not overpowering at all. This is what i had in my sling bag ALL of last year when I attended coaching classes that used to be strenuous and I used to wash my face with this exact product during every hourly break they used to give us and I would feel instantly relieved and refreshed to face the next session. Use daily to prevent the 10 signs of hair damage. Contains Keratin Damage blockers technology that provides 99% protection against damage. Gives you softer, more manageable hair. The shampoo is contained in a matte white finished container with a golden flip cap. Due to the broad base, the bottle can rest well on your bath shelf. It's pretty basic packaging and I have also traveled with this , it's travel friendly. No leaks. The product is really creamy in consistency and a pearly white color. It lathers well with more water, if your water is hard it may not lather as much. remove any greasiness from your scalp really well. The smell is the same as all Pantene shampoos, a sort of floral feel to it. So she was super impressed and she has very dry, frizzy hair and she said it left her hair feeling conditioned too. I feel the same about it, you do not always need a conditioner if you are using this product on a regular basis. The conditioner, too, comes in matte white container with a golden flip cap. Really creamy, heavy on moisturisation. Leaves hair really shiny and in control. Helps with keeping the frizzes under control. Doesn't weight my hair down too much, over all it does it's job well. lean towards liking the conditioner more in a range. This range proves me wrong. Summers have been so muggy and harsh. Just when I felt that the heat was giving away to cool summer nights, a heat wave starts to sweep the country. I feel really bad for those affected by the draught and the water crisis is so real, guys; we ought to take the time out to pause and decide as a country or as a collective world as to where this is all heading. I am very careful with water and the environment. Please try and avoid wastage as much as possible. In that way, even if it may be the least possible way, we can ensure that all of us get our daily supply of water. Skin care has been my top priority during this heat crisis. I have been doubling up on products, toners, rose water, cotton swabs and you get the drill! I've run through a few face wash tubes because I do not like getting all muggy and grimey. And I used to use a scrub weekly once but I finished this product from Nivea in these three months. I think I have a few things to say about it too. The products claims to be enriched with magnolia extracts to help you achieve clear and pure skin. A unique cleansing complex helps deeply wash off impurities. I really like this kind of packaging. It comes in a white tube with a powder turquoise blue cap. The base of the cap is broad enough to enable the product to stand in your vanity or bath easily. The flip open cap mechanism helps ease out just the right amount of product with a bare squeeze of the tube. The only minus is that you can't see how much product is left behind but I pretty much get to know when the weight of the tube starts to diminish. I cannot find fault with the packaging in any other way, infact I have to say the attractive white and blue look made me reach for the product and grab it. It is quite granular with little powder blue scrub beads. You can use it gently and in a circular motion especially around pores and blackhead areas, your nose which maybe the problem area for most of you. It is not very harsh and hence did not break my skin out. Feels comfortable enough. On days that I had the luxury of time, I would just leave it on as a face pack before my bath and wash it off in the shower. I did not find it give any enhanced sort of glow, nor did my blackheads reduce and when it comes to pores, I think it's just alright. It's definitely a nice scrub but not the best I have tried. Definitely has a gentler formula though than most in the market. It does not lather at all. It's more creamy, like you are wiping your face off with cream but not that creamy either that it leaves a residue behind. None of that. I think it's a multipurpose product and I like to take it when I travel, negates the need to take a face pask and a seperate scrub, face wash etc. All in one.